The clothing sets for kids come in a mixture of fabric. Sometimes the tee might be of pure cotton, whereas the shorts may be of denims. Thus keep a strict eye on the feel and texture of the fabric. Ensure good flexibility of the material so that the kid doesn’t face any problem in spend long hours in the outfit. Considering the fact kids clothing will regularly get dirty, you must need to choose a fabric which is washable and doesn’t fade with time. So longevity and durability are the two crucial features that you should look for while buying in the retail stores. The latest designs in clothing sets for children are pouring in with freshness and novelty. Apart from the vast variety in designs and cuts for little girls, from mini skirt-top, to shorts and tops, even boys can sport a lot of verve and smartness in these sets. Boy’s clothing sets manufacturers are looking into new genres of gallace pant sets, to dungaree, suspender, western cuts etc. All these come in the form of cute prints, cuts and stickers. Coming to girls, they have a huge medley of clothing sets in girlie styles and patterns. Make sure you go for bright and gaudy colors and prints, to enhance the liveliness. Make easy choices in case of kids clothing by keeping the season in mind. The wide array of kids clothing sets come in a superior range of materials, from warm to light so that you can select according to the season and weather conditions. Go for full-sleeves tees and gallace pants or full trousers in warm fabric if it is winter. From spring and summer, pick up soft the fabric which is soft with dry-fit technology, enabling proper ventilation and breathability. For girls, shorts and skirts are the right choice in the warm weather. 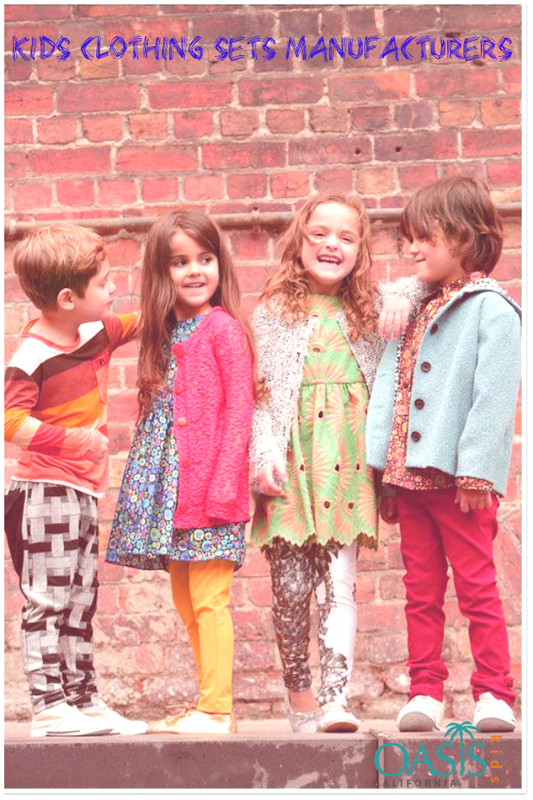 Thus, season forms an important factor while choosing clothing sets for kids. Always opt for a size higher than your kid’s actual measurements. Because they grow quite fast and quickly, go for a little bigger clothing sets so that they can be continued for a longer span of time. But also, keep in mind that that too over sized saggy clothing might make them look old and haggard, without featuring their structure properly in shape and pose. Sometimes the tee of the set might fit properly nut the other part might not. Thus size plays a pivotal factor in selecting clothing sets for kids. Today children’s clothing sets manufacturers are constantly producing freshly designed outfits to upgrade the stocks of the retailers and woo the little boys and girls easily.